At the first day of university holidays I left for the 3 day drive to Guincho to join my girlfriend who already went there few weeks before. The drive was long but easy and I only had a minor problem with my van, when the starter refused to work (one of the typical problems of the Boxer engine). A solid hammer and a fierce knock on a specific part of the engine made it work again. In the late afternoon of the August the 6th I finally reached the last curves of the coast road and had my first view on the bay of Guincho. The trip had begun. Claudia had been camping in the pine trees for the past weeks and was more than happy to change into my van. So was I. It was August, and Guincho, on top of its fame as a premium wave sailing destination, was full of windsurfers. It was summer and the beach attracted numerous locals and tourists. All of them together made a pretty impressive crowd. We set up camp at the parking lot in front of the Chiringuito and stayed for a week. 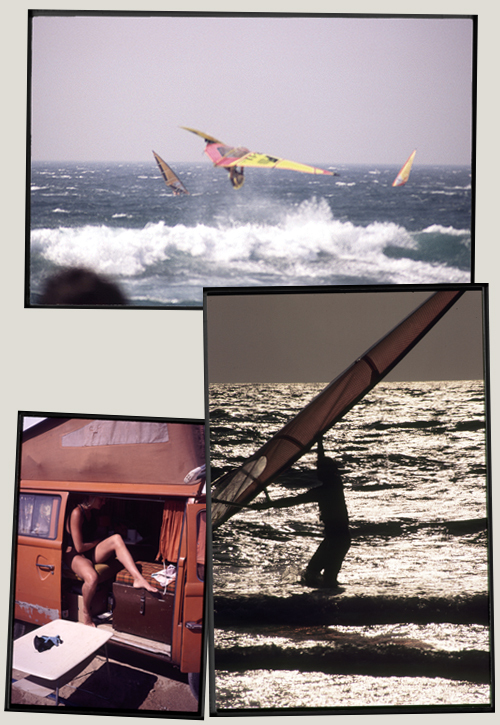 During that week we had some days with strong Nortado (thermal wind usually starting in the late afternoon which suits pretty good the party hungry windsurfing folks), a few windless days and a couple of days with nice waves. Classic Guincho summer setup. Perfect to get into the windsurfing trip mode.